Mike was Awesome! We had no game plan and we asked him to take us to his favorite places, they were all amazing. We had a wonderful day! My family and I wanted a private wine tour experience for my grandma's 75th birthday and this was perfect. It was her first time to wine country and she couldn't have had a better time. Dolly was our driver for the day and made our whole day so enjoyable. We were able to squeeze in a few surprise stops here and there and had a blast along the way. It was so easy having every winery stop pre-booked and knowing when/where you needed to be but not having to worry about a thing. Would absolutely recommend this tour to anyone wanting a wonderful day in wine country! It's an amazing trip. We had a great time and few winery visits. Truly enjoy Napa! The driver was pretty nice and helpful. She did recommend a great restaurant for lunch. She also knew a great place to stop along the way for a photo The limousine was a bit older and made a loud whump whump noise as we travelled down the road like the back end was having issues. The arm rests were a bit dirty and made me wish I had brought my disinfectant wipes along. Other than that, it was ok. Would probably book differently if I did this again as the limo seemed tired. Dolly was an excellent tour guide. She took us to wineries that we wanted to go to, but also provided information and took us to 3 great wineries that we were not aware of. She was a good driver and great to be with for the day. 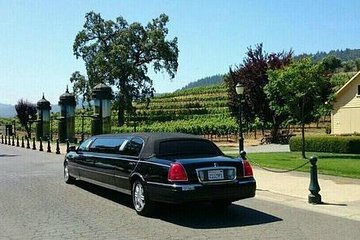 We had a delightful driver, Dolly, who was very knowledgeable, funny, and although changed our 2nd and 3rd winery choices, she was spot on and we loved where she recommended! A truly wonderful day, and Dolly was part of it! The limo was nice and she was very helpful. Overall a very great experience. Our driver was really nice and the whole day went smoothly on a pace that our group wanted. Our driver did a great job navigating difficult, rainy conditions on the road, and was very professional. Would book again!